Steve Souders weighs in on Velocity 2011 and looks ahead to upcoming Velocity events. This was Velocity’s fourth year and every year has seen significant growth, but this year felt like a tremendous step up in all areas. Total attendance grew from 1,200 last year to more than 2,000 people. The workshops were huge, the keynotes were packed, and the sessions in each track were bigger than anyone expected. The exhibit hall was more than twice as big as last year and it was still crowded every time I was there. Sample some of the tweets to see the reaction of attendees, sponsors, and exhibitors. #velocityconf Twitter stream have been asking about slides and videos. You can find those on the Velocity Slides and Videos page. There are about 25 slide decks up there right now. The rest of the slides will be posted as we receive them from the speakers. Videos of all the keynotes will be made available for free. “Look at Your Data” by the omni-awesome John Rauser. Velocity Online Access Pass ($495). Velocity 2011 had a great crowd with a lot of energy. Check out the Velocity photos to get a feel for what was happening. 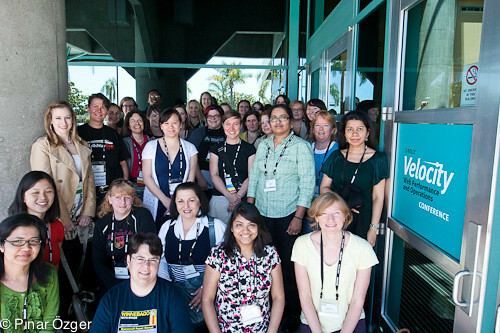 photo of the Women’s Networking Meet Up that took place during the conference (also posted above). Velocity 2011: Take-aways, Trends, and Highlights — In this webcast following Velocity 2011, program chairs Steve Souders and John Allspaw will identify and discuss key trends and announcements that came out of the event and how they will impact the web industry in the year to come. announcements that were made at Velocity. I worked with John at Yahoo! when he was with Flickr. John is VP of Tech Ops at Etsy now. He stepped into many of the co-chair duties at this Velocity in preparation for taking on the role at the next Velocity. Speaking of the next Velocity, we announced there will be a Velocity Europe in November in Berlin. The exact venue and dates will be announced soon, followed quickly by a call for proposals. and helping grow the WPO and devops industries in that part of the world. In addition, the second Velocity China will be held in Beijing in December 2011. And of course we’ll be back next June for our fifth year of Velocity here in the Bay Area. I covered a lot in this post and didn’t even talk about any of the themes, trends, and takeaways. on Friday, June 24 at 10am PT. It’s free so invite your friends and colleagues to join in. Velocity grows with more tracks, more topics and … bath products?